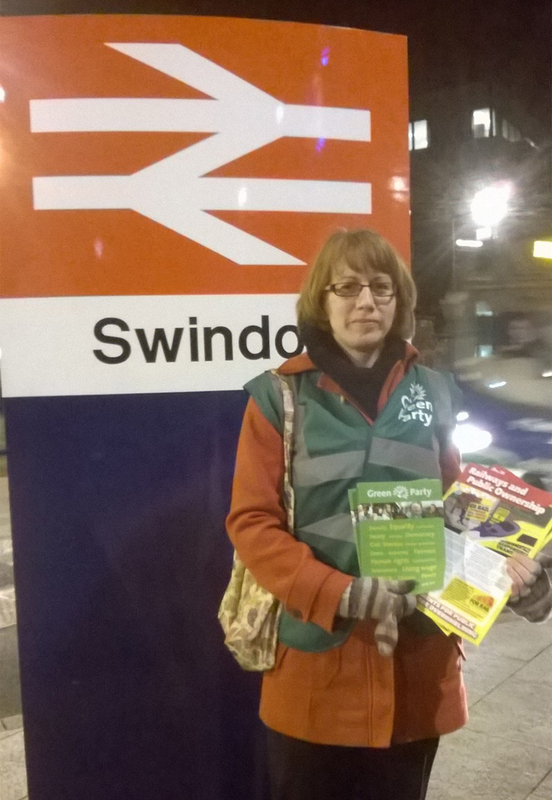 Today, I'll be protesting at Swindon railway station about the annual rail fare increases, and talking to passengers in the station about the Green Party's policy to bring the railways back into public ownership. While I am fortunate enough to live within a 15 minute cycle journey of where I work, 6 of the 8 people in my team rely upon trains to get to work. And on one of the busiest and most expensive line in Europe, that soon adds up. For example, for anyone commuting between Bristol and Swindon, it will cost £3,240 per year just to get to work every day. That's 14% of the regional average salary and will take anyone on that average salary up to the end of February just to pay for the ticket. (figures from http://www.bettertransport.org.uk accessed on 4/1/15). Some commuters may find their rail fares are increasing up to 4 times faster than their wages. These increases can have direct impacts on people; pushing them back into cars and Swindon's traffic jams, or forcing them to move jobs altogether as they can no longer afford the commute. But I'm not just protesting at the UK's high rail fares - and thanks to privatisation, we have the highest commuter fares for day returns and season tickets in Europe (Rebuilding Rail report 2012) - but also the chaotic system with so many different operators in the UK which makes it hard to find and buy the cheapest tickets. The Green Party's policy on transport would see the railways returned to public ownership, so they are run for the benefit of the people using them rather than lining the pockets of shareholders of those companies running the franchises. The mention of railways in public ownership sometimes makes people worry whether a publicly-run rail service could really work. Well, the answer is a resounding 'Yes!'. The East Coast main line has been run by a public operator, Directly Operated Railways (DOR), since the private company operating the franchise was unable to continue. For the last five years, DOR has received less in public subsidies than any private operator, has returned just under a £1Bn back to you, the tax-payer (not to a shareholder), has won numerous awards and received record levels of customer satisfaction, outstripping the former franchise holder and private-sector operators on other lines. Instead of celebrating this incredibly successful experiment in public running of a railway, the current government chose to re-privatise the service so that more wealthy shareholders can cream off a profit at the expense of the East Coast commuters and of British tax-taxpayers in general. We should be repeating the success of the East Coast on the Great Western Line, and all over the country, and taking back the railways for the benefit of the people that they were built to serve.